Walking in Stilettos on Cobblestone Streets: Women are over 50% of the US workforce... What happens in other countries? Women are over 50% of the US workforce... What happens in other countries? 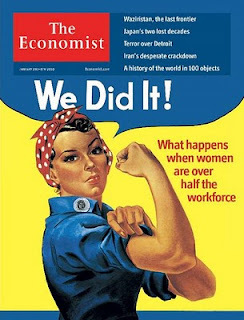 As a member of a younger generation entering the US workforce, I reaped the rewards that females fought for over the last 50 years. When I entered the US workforce, the glass ceiling had been chipped beyond repair. It was a given that men and women were equal and deserved the same treatment and rewards. It was my right to work and be judged as an equal to all. Upon joining the German workforce, I was shocked to learn that the state and treatment of women in the workforce was the equivalent to US in the 1960’s and 1970’s. In Germany, women still have to fight for the right to work and the right to be taken seriously. To put it into perspective: I’ve explained to multiple male colleagues the inappropriateness of calling a female colleague “gorgeous” and “beautiful” or in asking her why she isn’t married and at home taking care of her husband and kids (as all women apparantely should be). Additionally, some female colleagues need pep talks around dreaming big and not sticking to what they've been labeled. This is not representative of the entire German population – many males treat females respectfully and as equals and many females are strong and are achieving their dreams (whether this includes being a stay-at-home mom, working in an office, or something else). However, the naysayers still exist. It a shocking experience for a female, who never had to fight for her right to work or be treated equally, to suddenly be in the situation where this was necessary. It was interesting to read the cover story of the Dec. 30, 2009 Economist (click here for: article 1 and article 2). The two articles discuss details around statistics of women workers in multiple countries. Having only worked (in an office) in the US and Germany, I had formed my own opinion on what was helping and hindering the empowerment of females in Germany & the US. It was interestng to hear what was happening in other countires. 1. All Mom’s are guaranteed a 1.5 year (per kid) maternity leave, during which they receive 80% pay and are guaranteed their job back after the leave. Employers are reluctant to hire females because if the female has a baby (or multiple babies) – the employer must pay salary for the Mom and the temporary replacement. Employers are also reluctant to promote females to management positions because during a maternity leave, only a contractor can be hired. Enticing a good manager to work as a contractor (without benefits, less pay, etc.) is challenging. 2. Legally, employers must allow parents, who request it, to permanently reduce their work days to less than 100%. A parent working 3 or 4 days/week might not be able to complete all the work that the job requires. If the work is not done, they can’t be replaced or fired due to laws. It is an option to hire another person to do the remaining 1-2 days of work, but finding a person to work such a limited amount of time is difficult. 3. All errands must be done on Mon-Fri (9am-5pm) and Saturday (9am-12pm) when stores are open. Doing the errands takes a lot of time as it involves going to many small stores (one-stop shops are rare). For couples with kids (and therefore more errands), 1 parent needs to be available during work hours to do them (typically the female’s role). 4. There are few childcare providers; the providers that exist are very expensive. Also, babysitting doesn’t exist. If a couple has children, then financially it makes more for 1 parent to stay home with the kids (typically the female’s role). 5. Birth control is not easy to get. So many couples are having unplanned kids. This necessitates that the female stays home (see 3 & 4 above) and doesn’t have a chance to demonstrate their skills at an office. 6. The attitude of many males is very sexist. Many males believe that a female is only capable of being a stay-at-home Mom or a coffee fetcher. Thus, fewer are hired. The females hired in operational positions are often subjected to sexist comments and behavior. Ironically, some of these factors were put in place to promote women in the workforce. While not very beneficial in their current form, some of them could be beneficial if revised. Example: the reduction in the work days could be set to a standard 50%. Then two people could be teamed together to deliver 1 full-time job. This would ensure all work relevant to the job is done, and still allow for part-time work. In my opinion, the US doesn’t have the perfect model for working females. Many things also hinder empowerment in the US. However in comparison to Germany - females in the US have much better opportunities to succeed and accomplish their dreams. For that, I truly appreciate what females (and males too) have fought for and accomplished. I hope this trend continues.